At age five, Calissa was diagnosed with Arrhythmogenic Right Ventricular Dysplasia (ARVD), a heart defect that usually causes sudden deaths in young people. As a genetic disease, both Daly’s sister Camille and brother Colton have the same condition. Colton was the first to be diagnosed, followed by Camille and then Calissa. A very active family of multi-sport athletes, this diagnosis meant a complete change in lifestyle in terms of activity level. Since keeping in good physical shape is ironically one of the ways to manage the disease, Calissa’s parents looked into alternative, more low-impact options and came across curling. For people with ARVD, they have to closely monitor their heart rate and know where the closest defibrillator is at all times, as any physical activity or anxiety can cause a concerning spike in heart rate. 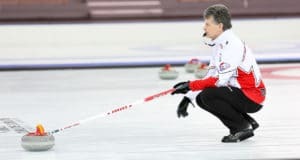 Daly’s parents were instrumental in getting defibrillators into many curling facilities where their children grew up playing, which has benefitted more than just the Daly family. And as for how Daly manages to keep her health in check while competing in a high-stress, competitive environment for a full week? Daly takes a positive spin and explains how dealing with ARVD has improved her game. Safe to say that this positive attitude will not only take Daly far on the curling ice, but also in life. 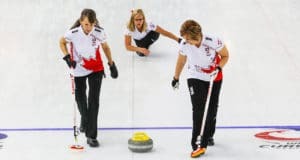 Daly’s Ontario team skipped by Thea Coburn improved its record to 2-2 after a 12-3 win over Sadie Pinksen from Nunavut this morning. Read more about the Daly family in our 2016 article. 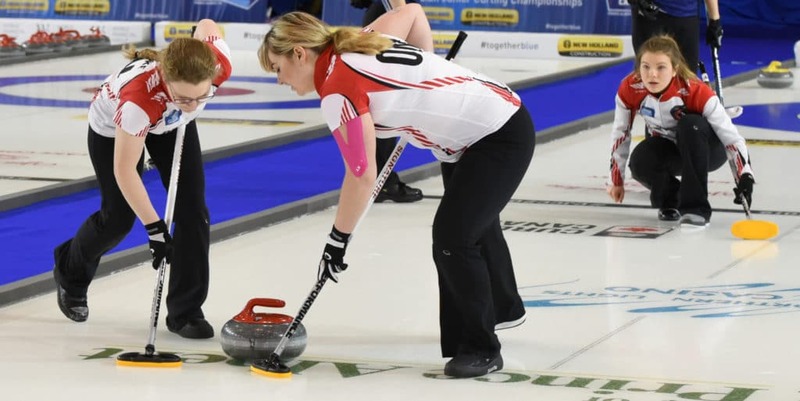 In the other New Holland Juniors women’s action, it came down to the wire with Nova Scotia’s Kaitlyn Jones needing a triple on her last shot to force Sarah Daniels from B.C. into a tough shot on her last. It hung wide and B.C. posted a 7-6 victory to move to 3-1 and hand the N.S. team its first loss. It was an East Coast battle on the men’s side with Nova Scotia’s Graeme Weagle having the edge over P.E.I.’s Tyler Smith in a 9-7 decision. Weagle now sits at 2-1 while Smith falls to 1-2. 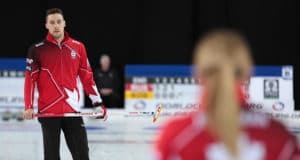 Team British Columbia skipped by Tyler Tardi continued with its dominant performance downing Newfoundland and Labrador’s Greg Blyde 12-4. Tardi moves to 4-0 while Blyde drops to 2-2. Desmond Young’s Alberta-based team defeated Trygg Jensen’s Yukon squad 10-2. Young improves to 2-2 and Jensen goes to 1-3. 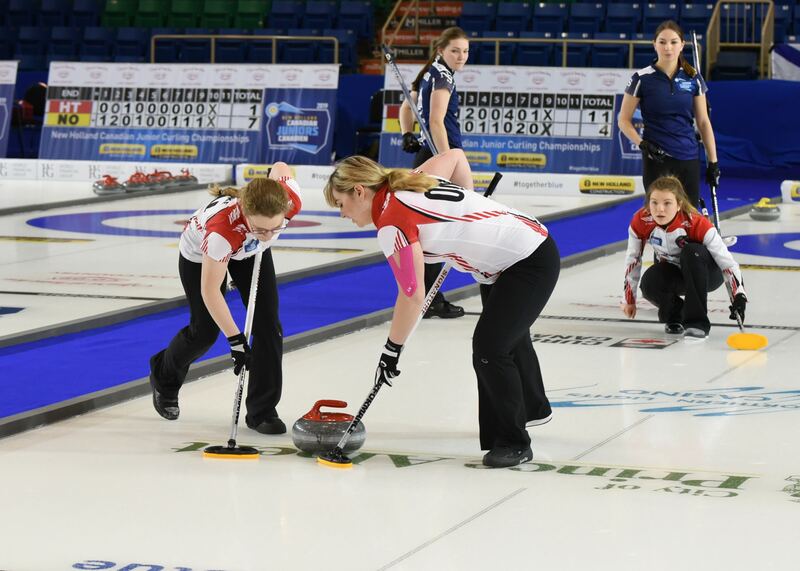 Action continues at the 2019 New Holland Canadian Juniors with draws on Monday at 2 p.m. and 7 p.m. (all times Central).